Today is one of the days of my headache because I started writing my business plan as per my intention. This is one of the things I am willing to do since long time ago, eventually the dream come true. Actually, this weekend is one of the long weekends in this year as of our company has set Monday as off-in-lieu for the voting day of Singapore GE which fall on today. I will be having two more long weekends, as I have two more leave days balance to clear in this month. Next week will be more longer weekend as of my leave day fall on Monday, the next day, Tuesday is Vesak day again. How good life is that? Writing business plan is a bit challenge to me. There are a lot of unforeseen obstacles that my business can face revealed. However, like what the saying, “A stitch in time saves nine”. Yes. It is true. It is like learning how to ride bicycle. Riding bicycle is also a challenge before you learned. There were a lot of chances that you can get injured. If you want to ride bicycle, you should face those challenges. Challenges are for the winners who want to get over them. 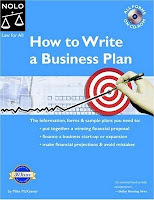 Last week, I have read a few books on “writing business plan”. Here is one of the books I studied. It’s quite helpful for me. Now, I am writing it as per guidance of this book. I think if you are the one who like to study; it will be helpful for you as well. Everything you need to create a business forecast that potential investors can embrace! Thinking of starting a business or raising money to expand an existing one? This popular book will show you how to write the business plan and loan package necessary to finance your business and make it work.